Shabby Barn, established in May 2012, is the creation of Louise Goodall and Jane Livesey, a mother and daughter partnership, who along with their family run the business from their home at Birch Farm. Sourcing most of their stock from France, Louise and Jane are always on the look-out and very successful in finding the unusual. Undertaking all the refurbishment themselves and with the help of family, they work their magic on all types of furniture, both old and new. As the local stockist for Autentico Chalk paint they are able to achieve fantastic, high quality results using their own particular style. This paint has a fantastic range of colours and shades and includes in the collection different coloured waxes and paint finishes e.g. eggshells, outdoor and emulsions for all surfaces. 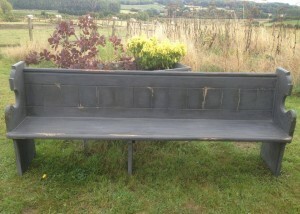 Why not look at the whole Autentico range at www.autentico.co.uk to see the extent of what Shabby Barn has to offer. Upholstery and re-upholstery is another service that is now offered (see separate page) and quotes can be provided. Just send them a picture and they’ll provide you with a quote. They also offer a bespoke service to their customers, taking on commissions to transform a piece to a client’s specification. No commission is too small or too large and over the years they have undertaken a range of assignments including one-off cupboards and dressers; a bedroom suite (including four poster bed), complete makeover of a Chelsea Restaurant and a project to transform a local tea rooms into a shabby chic style. Due to the success of the business, the Barn is now open Wednesday, Thursday, Friday, Saturday and most Sundays from 9am until 5.30pm. Louise and Jane are always delighted to see you; and whilst there, why not soak up the fantastic views of the Pang Valley.